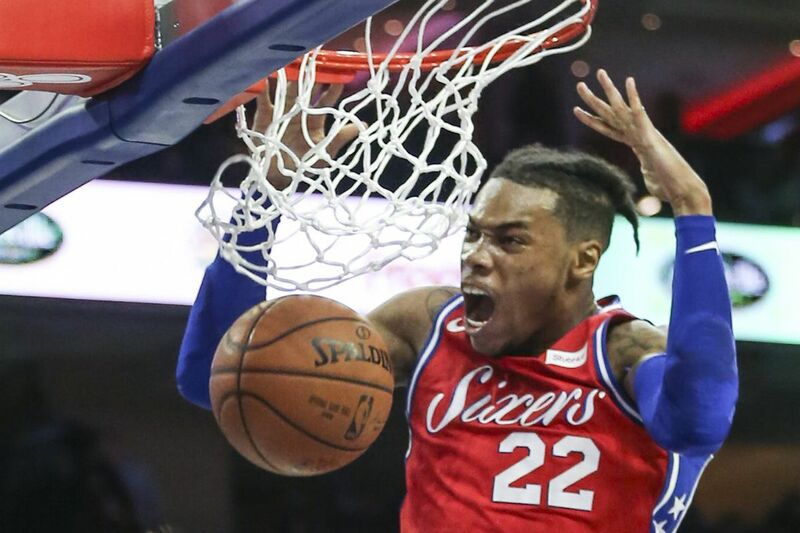 Sixers’ Richaun Holmes slam dunks against the Heat during the 2nd quarter at the Wells Fargo Center in Philadelphia, Wednesday, February 14, 2018. It was the tale of two halves Wednesday night at the Wells Fargo Center as the Sixers came back from a 24-point deficit to beat the Heat, 104-102. The Sixers didn't have their shining all-star Joel Embiid, but they found what they needed with heroic performances from Dario Saric and Marco Belinelli to supplement Ben Simmons' triple-double and a solid night from JJ Redick. Saric paced the Sixers with 19 points to go with eight rebounds. Belinelli, in his debut with the Sixers, scored 17 points off the bench including hitting 3 of 5 from beyond the arc. The absence of Joel Embiid, who was ruled out minutes before the game because of a sore right ankle, was definitely felt, but the rest of the team didn't seem prepared to step up in the early going. For all of the talk about the importance of finishing out their five-game home stand on a high note, the Sixers seemed completely checked out in the first 24 minutes of play. Sixers coach Brett Brown told his team at halftime that they have what it takes to win the game even with Embiid watching from the sidelines. "We have enough fire power in this room to comeback," Brown said of his message to the team at intermission. "But nothing will happen unless we guard." Then the Sixers came alive. Saric bullied his way to 14 third-quarter points as the Sixers returned to their defensive ways and outscored Miami, 34-19, in the third. Saric was unrelenting, leading the team on a tear that brought them within eight points of the Heat. Meanwhile Simmons was slowly and subtly collecting his 18-point, 12-rebound, 10-assist triple-double. Then it was Belinelli's turn to shine. The Sixers' newest addition hit three three-pointers in the first few minutes of the fourth quarter bringing the Sixers within four points of the Heat. "I was really nervous before the game," Belinelli said. "But I want to be on this team so bad. Just to play with guys that really go on the court and try to be better and try to play together and they want to win so bad. That's something I've really missed in the last couple years." With 5 minutes, 15 seconds left in the fourth the Sixers took the lead on a reverse dunk from Simmons off and alley-oop pass from Redick. Dwyane Wade tried to give the Heat the lead but failed to connect and on the other end with the shot clock winding down Redick hit an off-balance shot with 19.4 seconds left hit a shot that gave the Sixers a 102-99 lead. After a Miami timeout Wayne Ellington found room to shoot a three to try to tie the game but missed. The Heat had no choice but to foul, and Robert Covington used his time at the charity stripe to make it a two-possession game with 13.1 seconds left. Tyler Johnson was able to hit a three with 4.1 seconds left to make it a two point-game. A Sixers' turnover on the next posession gave Miami a chance to win it with a three but as the final buzzer sounded Wade's final attempt came up short. As exciting as the second half was, the first half was the Sixers worst half of basketball this season, with little or no redeeming qualities. Their defense was completely out of sync, they were coughing up turnovers all over the place, missing shots at an alarming rate, and racking up fouls left and right. James Johnson led the Heat with 22 points, followed by Goran Tragic with 18. The officials kept the Sixers on a very short leash, handing out three technical fouls in the first half — one to T.J. McConnell, one to JJ Redick, and one to Dario Saric — and making more than a few controversial calls. Despite the players frustration of the players and the boos coming from the crowd in the first half, the Sixers regrouped and used a complete team effort to put up the kind of fight you expect from a team trying to stay in the playoff race. In Embiid's absence, Trevor Booker and Richaun Holmes also added a spark off the bench, combining for 20 points. "We've come a long way since the start of the season," Simmons said. "We're learning to close out games and bringing them back."